Which is the best Free Antivirus Program? This is the most common question that my customers ask. A reliable antivirus program is vital to the good status and security of our computer. You can find many antivirus programs in the market, but which is the most reliable for your computer? Before you continue reading below, I must tell you that no antivirus program can protect us 100%, if we, ourselves, through ignorance or carelessness visit infected websites, open malicious incoming emails – usually – from unknown senders or install infected programs on our computer. I suggest you read this article on how you can keep your computer fast and safe. CCleaner: Freeware system optimization and privacy cleaning tool. How to install and use. AdwCleaner: This is a tool that deletes Adware/Toolbar/PUP/Hijacker. It works with a Search and a Deletion Mode. Malwarebytes Anti-Malware: A reliable removal tool for malicious threats. How to install and clean your computer with Malwarebytes. Top Free Antivirus software for personal computers. AVG Antivirus Free is the only comprehensive free antivirus suite on the market these days. The free version of AVG perpetually protects your PC from viruses and malware attacks. AVG Antivirus Free, additionally contains some additional safety features like internet protection, Email protection and Firewall protection in real time. The AVG's link Scanner continually protects you from malicious websites that host malicious code. The AVG’s Email Scanning engine protects you from emails that contain malicious attachments and therefore the Firewall engine protects you from hackers and alternative suspicious attacks. The AVG's Firewall can protect you from malicious attacks. Apart from these options, with AVG, you'll be able to perform scheduled scans on your PC during non operating hours and you ‘re continually updated with the most recent virus definitions. 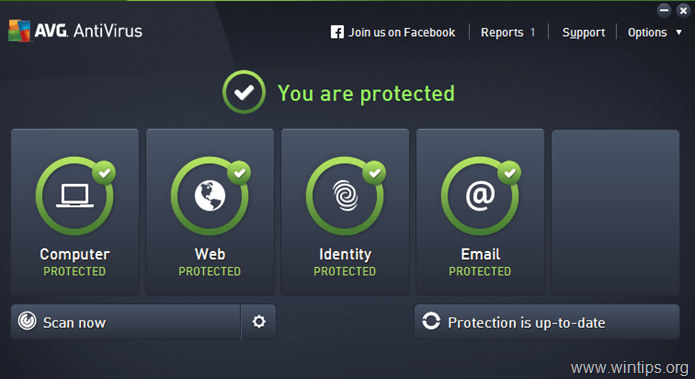 Overall, AVG Free is a smart protection and full featured program, easy to put in and manage. Avira Free Antivirus is a another nice option to defend your system from malware, viruses and rootkits. Avira Free Antivirus contains a robust scan engine that protects you from threats and has nice detection and removal results from separated labs. The program’s interface additionally includes a ton of configuration choices, like custom scan exceptions, scheduler, reports, etc. Avira Free Antivirus is a robust antivirus answer in the last years, however it doesn’t contain some further safety features like Web or Email protections. * (The only choice for Internet protection is to install the Avira Browser Safety toolbar that is out there for Firefox & Chrome browsers). Overall, Avira Free Antivirus could be a superb alternative for your protection. The program lacks further safety features, (like Email or Firewall protection) however it's a good choice to protect your computer for free. * Note: Email and internet guard protection is enclosed by default in Avira Antivirus Professional version. BitDefender Free Antivirus, offers a powerful antivirus protection in real time and stops malicious programs and rootkits before compromising your system. Program's interface is very minimal (only has options to toggle "Virus Shield" and "Auto Scan") and lacks options that paid antivirus products include like Web, Email or Firewall protection. BitDefender Free Antivirus, is simple to be installed and managed, works mutely on the background, doesn't waste many system resources and has great scanning and removal results for different security testing labs. Microsoft's Security Essentials (the name was changed to "Windows Defender" on Windows 8, 8.1, and 10) is both an anti-virus and anti-spyware program. The program protects your PC in real-time, is auto updated regularly, it doesn't take much disk space for installation and it doesn't slow down your PC. Windows Defender is enabled by default in Windows 8, 8.1 & 10, unless your system comes bundled with another antivirus suite (commonly TRIAL) from the computer manufacturer. (In that case Windows Defender is disabled and you have to uninstall the bundled antivirus in order to enable and use it as your main antivirus). MSE is available for free for Windows 7, 8, 8.1 & 10, in 25 languages and has received great score from several AV test labs. That's it! Which free Antivirus do you think is the best for you? « How to find classic Internet Explorer in Windows 10	» How to find & manage Windows 10 Update options. Thanks for sharing such useful ideas. thanks for sharing this information with us, most of the people use free antivirus and they didn't know sometimes they are doing some wrong thing. @Bruce: Panda AV is good but heavy. Very good and reliable article for computer beginners and students. Thank you very much for seeing this. one more thing avast indeed used too much disk speed while I had HDD what I did is to upgrade to a SSD and there was no more problems with disk usage btw I am using win10 thats why I had to upgrade when I had those problems with avast I simply reinstall it. ESET Smart security and once eset nod4 and I had each one for one week I had tested few av tools including eset after 2 days after installation when I log on to windows the eset appeared on screen as normall however computer have frozen and after 10 mins the blue screen of death appeared in both versions I had no choice but to reinstall windows. since than I don't trust eset. I had norton internet security but it was too expensive fo one year of full version. I also had avira free antivirus but when I try update it needed 3.4 GB of data to download what is even more expensive and also it was annoying by telling me that I have viruses in my coputer what is even worse it took into quarantine the windows system files (.sys) that are part of windows after what I had to restore entire system in earlier point in time and that was happening too often. I tried with AVG but same as avira and norton too expensive for maintance. 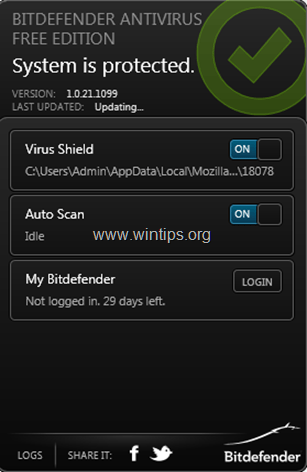 bit defender – not good enough and scan took long time also avast was tested by trojan hourse and only avast found it. kaspersky internet security – as soon as I install I had to restart and than BSOD repeatlly appeared and I had to boot in safe mode to uninstall. I have tested a lot of antiviruses and IMO only avast proven worthy. – when detecting a virus first avast is trying to repair the file and then if not succed it removes it into quarantine in difference for other antiviruses who removes it immidiatlly no matter if it is a vital file or not. TAKE NO OFFENCE but I think this is more than enough reasons to keep Avast over other antiviruses. Avast seemed good until I got a virus while running it, and yes I kept it updated. As for all those othere issues with BSOD and every virus program you tried…. Ummm…… take no offence but the only common denominator seems to be you. I didn't say that avast is the best of course there is no 100% secure tool to help you against every existing threat on the net or anywhere else. There is no perfect antivirus! that means you can get infected by using any antivirus mentioned here including avast. I just mentioned my favorite antivirus and why I use it. I also mentioned why I don't use other tools. Of course you may never experience those issues but I don't want to risk my data trying all of them again to see if any of them are better than others. You can use your own antivirus I didn't demand you to use a specific one! If you don't like avast that's ok but don't criticise those who like it. what about avast free antivirus? @kiki443: Avast is a pretty good antivirus too, but in some cases slows the system (or causes high disk usage). @ashok sharma: ESET is an excellent antivirus but doesn't offer a FREE version (Only 30-days Trial). I had Prey installed on a laptop and a desktop when I was in college. Back at home I dont need Prey but have not found a way except going deeper in my pc than I am comfortable with. Without changing a bunch of stuff inside , do you know of anything that will remove prey? @Bill Skinner: Look at this article for Prey Uninstall instructions. Great website! Thank you very much. One question: how do you get rid of AdChoice ads? I've tried everything that I can think of and the only way I've found is to buy Adguard but I'd like to not have to use software to block the ads. @Jim Homan: Use this malware guide to remove AdChoice ads: Quick Malware Scan and Removal Guide for PC’s.